It happened. We graduated and packed up the Rav to head down to Smith Rock out near Terrebonne, Oregon. I hadn’t been in almost 5 years (since the summer after my junior year in high school) and was stoked to go back and lead some of the routes that fired my initial love of rock climbing. We were there for 12 days and 11 nights, my longest climbing trip in quite a while. Maddy and I packed up the car in the morning and headed down to Oregon. With some stops for food and gas, we made it down to Smith Rock in about 7 hours. We pulled up to the campground, set up our tents, and headed down the trail to get a couple of routes in and start getting our Smith Rock faces on. We headed to the 5 Gallon Buckets area, but there were people (not surprisingly) on all the easier routes, so we continued up to the Peanut to start out our trip on Hop on Pop (5.8). We both lead the route, and I didn’t freak out too much about the knobs seeming to flex when I pulled on them. Then we headed back and both sent the 5.9 to the right of 5 Gallon Buckets before heading back to the campground for the day. Nothing too challenging, but it was good to get on the rock after a long drive. Checking out the guidebook cause WE’RE AT SMITH ROCK!!! When it wasn’t windy, it was pretty hot in the sun, so we decided to start out in the shade by heading over to the Mesa Verde Wall. We’d never been there before and knew there were a good number of classic knob routes. We warmed up on Cosmic (5.10a) – an onsight for Maddy and a flash for me. We wanted to get on the ultra classics Screaming Yellow Zonkers (5.10b) and Moons of Pluto (5.10d), but another party had just started Screaming Yellow Zonkers and we were not sure our rope was long enough for Moons of Pluto. Instead, we decided to go for Bad Moon Rising (5.11a). It was my turn to go first, so I got on the sharp end and went for the onsight. I made it past the tricky moves on crappy rock down low, the stellar 5.10 knob climbing in the middle of the pitch, and up to the last bolt, below the roof. I jumped right into the roof moves, since there wasn’t a good rest and I was already feeling pumped. I managed to get one of the knobs over the lip, popped my right foot out onto a knob, then struggled to get up onto the upper slab. There was another, better knob, but I couldn’t reach it. So I fell. It was a long, but safe fall and after resting and de-pumping for a second I easily pulled the roof by using some better footwork to gain the second, much juggy-er knob to pull over the roof. Instead of trying to redpoint the route, I had Maddy clean it after following on TR so we could try the other classics at the crag. We both sent Screaming Yellow Zonkers first try, but then the sun came before we could get on Moons of Pluto. We headed back to the front side to play on the 5 Gallon Buckets and Overboard walls a bit more. But they weren’t in the shade yet, so we stopped at the Dihedrals and climbed Wedding Day (5.10b) – an onsight for me and redpoint for Maddy. Then we headed over to tick 5 Gallon Buckets (5.8), both redpointing it. We were both interested in Magic Light (5.11a) and Overboard (5.11a/b), so we decided to try one of them (Magic Light) as the last route of the day. I got about 2 bolts up before I got awful hand cramps in both hands (simultaneously) and dropped my chalk ball on the ground. I decided it was Maddy’s turn to lead. She headed up and couldn’t figure out how to move left onto Magic Light, so continued straight up on Overboard instead. She took a couple falls at the crux, but finally figured it out (which was good, because I was pretty much out of commission for the day) and made it to the anchors. She cleaned the route and we headed back to the campground, deciding we definitely needed to bring more water the next day. This was our first gorge day. 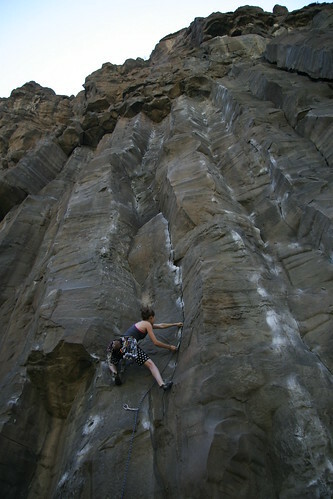 I remembered loving the basalt columns of the Gorge on my first trips to Smith and was excited to go back and lead many of the routes I had tried on toprope. We spent the whole day on the West Columns because it was somewhat cloudy and breezy all day, making the temps good even in the sun and rather chilly when we were in the shade. Maddy isn’t super into the trad leading thing, so I lead everything and she followed and cleaned. We warmed up on Badfinger (5.10b, redpoint), then climbed Rim Job (5.10b, onsight), Wildfire (5.10b, onsight), and Cruel Sister (5.10a, onsight), with many rests in between since I hadn’t slept well the night before. To finish up the day, we both toproped Crack-a-no-go (5.11b), which I wanted to eventually try on lead, but after toproping since the tricky gear placement is supposed to be the crux. I flashed it on toprope and started working out the gear beta. But we were pretty tired, so we hiked out, made dinner, and went to bed early, only to be woken up at 3am by some people noisily setting up their tents. We were glad this was a rest day – not only were we tired, but the campground was absolutely swamped with weekend people – mostly not climbers (or people paying to be guided for the day) who thought it was ok to leave their stoves, coolers, etc. set up at one (or two!) of the ~10 picnic tables for the whole day. Apparently the concept of shared space was not apparent to many of these people. We had a lazy morning, then headed to Bend to get some Chai before going to Portland to pick up Luke. We got some yummy baked goods from Great Harvest Bakery and shared a slice of pizza from the Bite of Bend food fair. We drove to Portland via Salem (since I’d never been that way and we had some time to kill), then after some furious phone calls by Maddy, found the only retailer in the greater Portland area with Miuras in Luke’s size, since he’d called to tell us he forgot to pack climbing shoes. Shoes in hand, we picked up Luke from the airport and headed back to Terrebonne. We had a very delicious dinner at the Terrebonne Depot, a relatively new restaurant near the train tracks on Smith Rock Way. The fish tacos were AMAZING. Back at the campground, we met up with Kevin and Jon of Climbfind and chatted for a bit, making plans to meet up at Cocaine Gully the next day, before heading to the tent for the night. Luke and I scrambled up “the nostril” into Cocaine Gully, while Maddy headed over towards the Dihedrals to meet with some friends from the Vertical World team who’d moved to Bend. 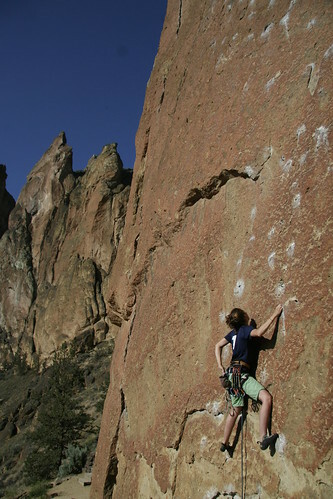 Our plan was to warm up on Chicken McNuggets (5.10b), which, like many classic 5.10s in Smith Rock, I’d done before on toprope. The beginning part was trickier than I remembered and my nerves contributed to my taking an accidental warm-up fall on the first bolt. Then, with the falling jitters mostly subdued, I proceeded to send the route. The huge nubbins on that last wall are wild! Luke lead the route also, before moving up-gully to Powder Up the Nose (5.10d). Luke lead the precarious tiny-nubbin-pulling and we decided that I would just toprope this one, which I did, since the crux pulls were an uncomfortable distance above the last bolt for the second route of the day. Then Luke went up to remember the moves and put the draws on Freebase (5.12a), which he’d tried on a previous trip to Smith. We were also joined by Kevin and Jon, who hopefully enjoyed TRing the routes we’d done and borrowing my rope to lead Chicken McNuggets. It was my turn next, so I got on Vomit Launch (5.11b), which I’d been told was really awesome. I decided not to go for the onsight, because I expected I would get super pumped trying to figure out the sequences. I took a couple of rests on my way up, but didn’t find any genuinely hard moves (just some delicate footwork-y ones, including a lockoff that allowed me to static the move to the big jug that is apparently a deadpoint for most). Then Luke sent Freebase! His first 5.12 of the trip! While Luke onsighted Bloodshot (5.11c), I went to get Maddy, who I thought would enjoy Vomit Launch. She did very well, taking only two falls. This encouraged me, so I went for the send. I focused on moving efficiently so I could minimize the pump and in no time I was on the final crack jugs and clipping the anchors. That route is way fun and I would definitely recommend it for someone just breaking into the grade since there weren’t really any “hard” moves. We finished the day with 9 Gallon Buckets (5.9) and then Luke lead Overboard (5.11a/b) so Maddy could work the crux on toprope. I abstained. I was beginning to realize I really wasn’t a fan of the ridiculously greasy and polished routes in the Morning Glory area – I like my footholds to be sticky! We finished the day with breakfast burritos for dinner and a bit of slacklining and hanging out with Kevin and Jon before they headed down to California. The morning arrived without a definite plan. We slept in a bit (Luke was so excited the first day that he was pretty tired, which is unusual 😀 ) and headed to the Dihedrals. 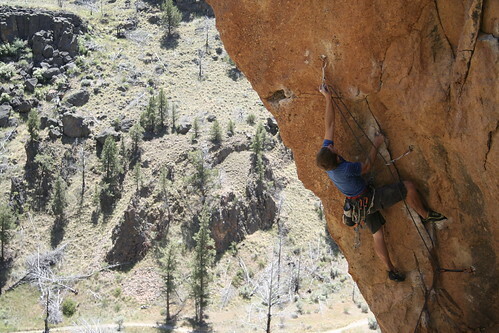 Everything was in the sun already, but we found some routes to warm up on – Helium Woman (5.9) and Captain Xenolith (5.10a), which Luke onsighted and the rest of us flashed. When we finished, everything was still in the sun (we were still getting used to the whole sun/shade issue at this point, as our first several days had actually been fairly cool). Luke and Maddy worked on Latin Lover (5.12a) and Take a Powder (5.12a/b), which were in the shade (amazingly). Latin Lover worked well for Maddy’s small fingers, but not so well for Luke’s man fingers and Take a Powder had a very hard crux section (which I did not do, because I was reserving my energy for 5.11 projects, since I’m learning I don’t have as much energy to expend as Luke). It was hot in the sun at Helium Woman and Captain Xenolith. Finally, Moondance (5.11c) got in the shade, so I nervously roped up for an onsight attempt. I fell once in the runout section below the rest jug, having gotten myself too far to the right on bad holds. After resting, I sent the remainder of the route to the anchors. Maddy then flashed the route (her first lead of the grade), which kind of made me feel lame. But I made up for it by sending the route next try. Maddy and I were both tired, but Luke still had a little leftover energy, so we stopped by the 5 Gallon Buckets area for him to do a few jughaul cooldowns. We decided to take this as a half rest day, with a full rest day a couple days later. We thought that two full rest days might limit our climbing time too much, while only one rest day would just not suffice. We had a relaxing morning, then took a trip to the grocery store, followed by some reading time and a leisurely lunch at the campground. We headed down into the Gorge around 3pm, when we knew the West Columns would be in the shade. Since Pure Palm (5.11a) was one of the goals for the day, we warmed up on Cornercopia (5.10b). I lead it first (a redpoint, since I’d TRed it before), then Luke and Maddy followed it to warm up their stemming muscles. 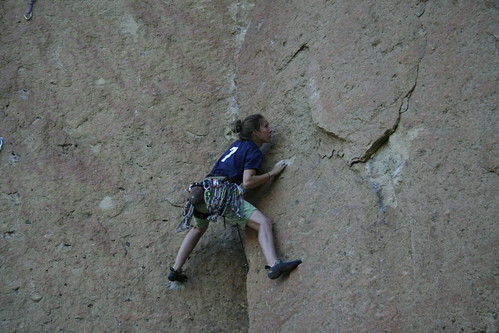 Lizzy warming up on Cornercopia (5.10b). Luke went first at Pure Palm, but couldn’t figure out and commit to a sequence at the first crux, which comes when your feet are at the 3rd bolt. I tried next, but fell while trying to make the move, so it was Maddy’s turn. She used some ridiculous beta involving taking both her feet off at the same time and doing a hand-foot match. She unfortunately fell near the upper crux or it would have been a very impressive flash. I decided to try the ridiculous beta on TR so I would be more comfortable on lead, climbing up to the rest ledge, then lowering to rest for my next go. In the mean time, Luke sent the route, but highstepping his right foot (whereas Maddy used the left). I ended up doing the same thing on my lead go, making it safely to the rest ledge and facing the unfamiliar territory to the anchors. The last couple moves were extremely thrutchy, since I couldn’t seem to get back in the stem, but I somehow managed to send and clip the anchors. Luke wanted to try Last Chance (5.10c), so he located it and onsighted it. 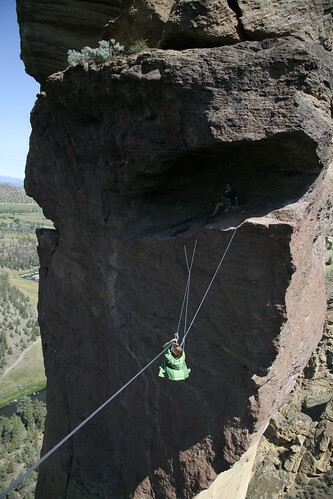 Maddy followed it, since I wanted to save it for another day in the Gorge when there was time to lead it. Instead, I used the waning light to get on On the Road (5.11a), which I’d TRed a long time ago. 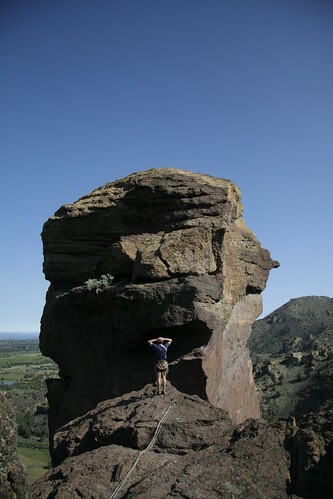 I psyched myself up for the crux bit from the ground, but once I got up there the “crux” didn’t even seem hard. I reminded myself to stay focused and not mess up the send after floating up the “crux”. The hardest part was probably the section of off-fingers (purple camalots) before the crack went to thin hands and then hands. Even though the guidebook said to bring a “big hands piece” for the top, I only placed one yellow camalot and could easily have managed without it. This was an awesome send for me because it felt fairly easy in comparison with my struggle a the top of Pure Palm. If there had been more light, I would have kept going, but it was getting dark, so Luke cleaned the route and we hiked out of the Gorge for a late dinner. Although our half rest day was awesome, it was not very restful and everyone was feeling a bit tired the next morning. After a somewhat slow start, we decided to start the day at the Northern Point and take it from there. Although Northern Point features many short, easy topropes, more recently there have been some pretty cool sport climbs added, too. We arrived at the cliff only to find that we hadn’t slept in quite enough and the easiest route, a 5.10c/d, was still in the sun. So we decided to “warm up” on one of the 4 star 5.11s the cliff offered, because it was actually in the shade. 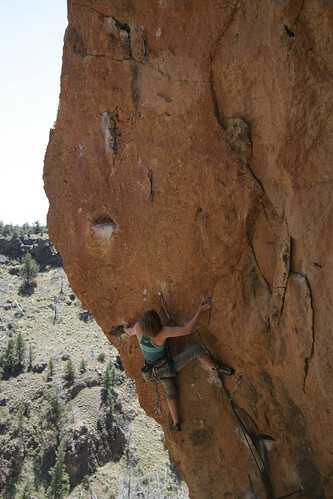 Luke onsighted A Woman in the Meadow (5.11a) and Maddy flashed up to the awkward and powerful undercling crux. She took a fall that tweaked her ankle, so it was my turn. I flashed it, but got super pumped in the process. Then we moved on to Limbo (5.11a), which Luke also onsighted. I was still feeling pumped, so I just toproped this one and Maddy lead it with a fall or two. We also did Jungle Fever (5.11b), as well as a 5.12a (only Luke did this one, but he sent on his 2nd try), a 5.10d which may have been a bit harder due to a missing hold, and a 5.11c. I was having a crappy day, so I didn’t do all of them, but Luke and Maddy climbed well and we ended up having a full day of climbing at Northern Point. This, finally, was to be our full rest day, although it was not devoted entirely to resting. Luke had wanted to try to do the highline out to the mouth cave on the Monkey, so we got up fairly early and hiked up Misery Ridge (it was quite hot). Then Luke and Maddy rapped down and climbed the Pioneer Route (5.7 A0) to the mouth cave. 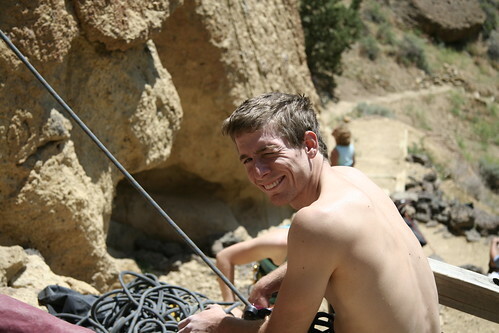 I helped them set up a tyrolean off the Monkey, then Luke went back across with his webbing to set up the slackline. It took us a while to set it up, but we were able to get it pretty tight and Luke and Maddy spent some time trying to get established on the slackline (I’m not very good at slacklining to start with and I knew the exposure wouldn’t help…). In the end, nobody really got far off the ledge, but setting it up was good practice and Luke realized that he needs to slackline more often to mentally prepare himself better for highlining. It was after 1pm and we had dinner plans in Bend, so we hiked the hot trails back to the campground, piled in the car, and headed to a deliciously greasy Taco Time lunch (normally my stomach can’t handle fast food, but I’ve had Taco Time since I was little and it is my one guilty pleasure whenever I come back to Washington). We returned to the campground to shower and reorganize the car, then headed to Bend, where we picked up some more yummy baked goods and sourdough bread and killed some time at the local REI before heading to the home of Maddy’s friends for dinner and socializing. We got back to camp a little late and went to bed right away in preparation for an early morning. We headed down to the Christian Brothers and hopped on Barbeque the Pope (5.10b) as a warm-up, even though it was already in the sun. I went first, barbequing my toes, and Luke and Maddy both lead it also. 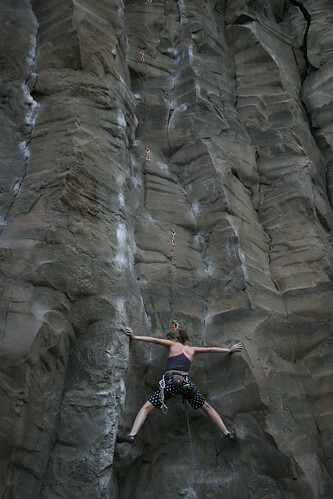 Then Luke racked up to redpoint Wartley’s Revenge (5.11b), a steep juggy crack line that he’d tried before. He sent, with plenty of worrying about gear in the questionable rock, and Maddy and I followed (I, at least, was into energy-conservation mode again in preparation for an attempt on my top goal, an onsight of Sunshine Dihedral (5.11d) later in the day). Maddy lead up Latin Lover (5.12a) with a couple falls, but afterwards everyone else’s project was still in the sun (as usual). Luke walked over to Aggro Gully and found that it was not only breezy, but also shady over there, so we headed there to climb and wait out more shade at the Dihedrals. Luke sent Toxic (5.11b) on his second try and Maddy wasn’t able to figure out the dyno, so she cheated a bit to the right and eventually got to the anchors. After letting Maddy and I take naps, Luke got on Up for Grabs (5.11d), which he lead with a couple of hangs. It was getting a little cooler, so we figured we could head back to the Dihedrals. I re-warmed up on Moonshine Dihedral, which I’d onsighted 5 years ago, finding it a bit slipperier than I’d remembered, but good practice for placing lots of nuts. I traversed over to the first anchor on Heinous Cling (5.12a) and set up a toprope for Luke and Maddy to play on while I rested for Sunshine Dihedral. The gear had been tricky and not the most bomber (I placed some #2 and #3 RPs and Stones that made me nervous), but it was all there. I cleaned the route on my way down and Luke toproped it, struggling a little more since his larger fingers couldn’t fit in all the pods. As I was putting the gear back on the rack, some older dudes walked by and asked what route we were doing. Upon learning the grade and fact that I had just onsighted it, they were very impressed (yes, sometimes its nice for the chick to impress the dudes!). We celebrated by heading to Redmond for pizza. I was thrilled and felt satisfied with my climbing trip, even if I didn’t climb anything else. This was Luke’s day for the Monkey, so we got up reasonably early, hiked over Asterisk Pass, and headed to the West Face of the Monkey. Luke wanted to try Astro Monkey (5.11d), which started with the crux 5.11d pebble-pinching and slab-climbing pitch, followed by some easier pitches, a 5.11a pitch, and finishing by climbing Monkey Space (5.11b) up to and out of the West Cave. The initial pitch turned out to be pretty hard and it didn’t seem like many people climbed the route at all. Luke ended up rapping off and we decided to just climb the West Face Variation at ~5.8 to Bohn Street, then do Monkey Space to the summit. With some simul-climbing, we made Bohn Street in one pitch from the ground, then Luke lead the first, wild, traversing pitch of Monkey Space (5.11a). Maddy and I both had some scary following to do, but we all made it safely to the West Cave. The last pitch pulls onto the roof of the cave and up out on steep jugs. Maddy and I struggled following it due to our shortness and our difficulty removing gear, compounded by the fact that we aren’t used to climbing hard multipitches with 3 people and the rope management proved tricky. After rapping on the Monkey, we hiked back to the campground (it was already ~5pm) and got some ice cream from the climbing store, which was nice after the hot hike. We made dinner and went to bed early again, hoping to get some early climbing in the next day before taking Luke to the airport and heading back to my parents’ house. This last morning was the time for everyone to get some last sends in, but I was still feeling fulfilled and not particularly motivated after having sent Sunshine Dihedral, so I was happy to mostly just belay Luke and Maddy. We got up early and headed to the 5 Gallon Buckets wall, where Luke “completed the wall” by sending every route (that he hadn’t already done this trip) except Zebra Seam and one of the extensions. Maddy warmed up by following a couple routes. She had wanted to get back on Overboard, but some locals were hogging the Overboard wall, so we decided to head straight over to Latin Lover. Maddy racked up her draws and set off to put the draws on the route. 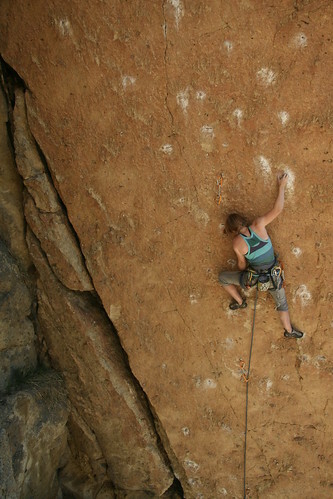 However, she kept not falling and made it up onto the arete, clipping the anchors and sending her first 5.12a (I think her hardest previous route was Moondance (on this trip) at a soft 5.11c). She was pretty stoked and gained the same fulfilled feeling I’d gotten from Sunshine Dihedral. Luke wanted to squeeze one or two more routes in, so we headed back to Morning Glory, where Lion’s Chair (5.11a R) was still in the shade. Luke decided to go to the first anchor (5.10c) and then decide if he wanted to continue up the full pitch. The climbing turned out to be weird and awkward, so he decided to call it a day at the first anchor. Maddy followed, rapped, and we were hiking back up to the campground to pack up the tents and the car. We made good time to Portland and had an hour before we needed to drop Luke off, so we stopped by the Portland Patagonia store (I LOVE visiting Patagonia stores, even though it pains me that I can never afford to buy anything…). Then it was time to say goodbye to Luke (I won’t get to see him for almost 3 weeks!) and drive north back to Poulsbo. Overall, I think it was a fantastic trip. Maddy and I both sent a lot of routes at the harder end of our difficulty range and though Luke didn’t end up doing as many 5.12s as he’d hoped, I think he learned a lot about mental space. If you’re interested in any of these routes and want more beta (I’ve tried to keep this post pretty beta light or it would be EVEN longer), comment and we’ll be happy to fill you in. Wow… this reads like a Smith Rock classics ticklist! Well done, Lizzy (and Luke, and Maddy)… sounds like you guys had an awesome time. The pictures are GREAT, too! 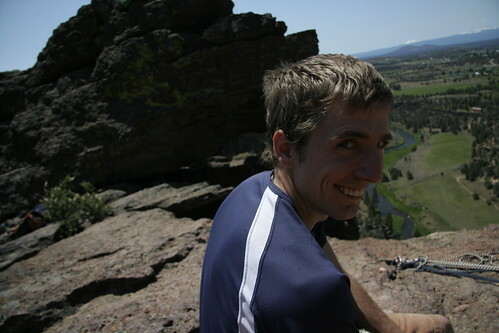 That brought back some sweet memories from Smith Rock. Such a fun place. Awesome trip report! Strong climbing and great pics! Sounds like a great trip. Good job on Sunshine Dihedral, and to your sister on Latin Lover, that thing is HARD! mmm hmm. I love Smith Rock. The pictures you got of the place were awesome too. Well done.